What are resilient sound clips? Resilient sound clips are isolation mounts that install in rows directly to the ceiling or wall framing. The resilient clips then have furring hat channel attached via pressure fit and layers of drywall or wood fasten to the channel. Decoupling is the most effective way to isolate sound over all other methods including damping, mass, and absorption products. Can I install resilient sound clips over existing drywall/wood? Long answer, installing over rigid surfaces like drywall or plywood is possible, but will seriously reduce performance. Reduce the loss in performance with R-6 fiberglass batt insulation between the furring hat channel and the existing surface. We recommend doing this after installing the clips and channel so the channel can support the insulation. Review the GenieClip™ product page for ratings on retrofit installations. Should I follow the staggered or standard layout? We show both layout options on our resilient clip install guide. Both will provide excellent performance. Standard layout will use fewer clips and install quicker. Staggered layout will help distribute the load of the drywall evenly. All sound tests for any brand of resilient sound clip use the staggered layout. Is the layout for the ceiling the same as the walls? Yes. You may want to consider the staggered layout in ceilings with joists less than eight inches in depth. What types of sound do resilient sound clips isolate? A high quality resilient sound clip will maximize isolation performance for airborne, impact footfall, and structural noise. Low, mid, and high frequencies are isolated with resilient sound clips. How many layers of drywall should I hang from the clipped channel? Single layer drywall is the minimum of course and acceptable when clearance is of concern or when resolving mid to high frequency sound problems. Double layer 5/8″ is recommended for most projects. Triple layer 5/8″ is recommended in areas where low frequencies are of concern. What type of screws do I use? Drywall to Channel: Fine thread or coarse thread drywall screw, determine the length by adding minimum 1/2″ to thickness of layers being fastened. Will the resilient clips and hat channel support the weight of the drywall? Yes, of course. The structural support of a resilient sound clip system is several times that of the actual weight of drywall you will be suspending. The reason we stress the spacing of hat channel based on the weight of the assembly (layers of drywall) is just for acoustic load per clip, not structural support. Test results for walls vs. ceilings are very different, why? Ceilings are heavy and more rigid, whereas walls are easier to isolate because they are lightweight. Adding decoupling, damping, and mass to a lightweight wall will provide greater results than adding the same products to a heavy, rigid ceiling. An STC rating of 52 in a wall with Green Glue Compound will likely yield a mid-40’s STC in ceilings. An STC rating of 64 in a wall with GenieClips® RST will yield an STC 54 in a basic ceiling assembly. Do I need to clip my ceiling to isolate footfall/airborne noise from above? If treating the ceiling only, then yes. Using products like damping compounds, pre-damped drywall, mass loaded vinyl, sound board, extra layers of drywall, etc., will not help with isolating footfall noise. However, the damping compounds and extra layers of drywall will help increase performance on a resilient ceiling. What is Green Glue Compound? Green Glue Compound is a sticky latex based material applied between rigid materials as a damping compound, not an adhesive. Green Glue Compound is most often used between layers of drywall, plywood, or HardiBacker. Who manufactures the line of IsoDoors? We design and manufacture the line of IsoDoor from start to finish. Because of this, we have full control over lead time and custom designs to meet the requirements of nearly every customer. What is the thickness and weight of mass loaded vinyl? How does Green Glue Compound work? In a constrained layer damping system, sometimes referred to as CLD, a damping material is sandwiched between two other materials (usually stiff/center of the “sandwich” is sheared rigid). For example, Green Glue Compound sandwiched between two layers of drywall. Damping occurs when the viscoelastic center of the “sandwich” is sheared (see image above). When bent, shear forces pull and stretch on the damping material. Under these conditions, the unique polymeric construction of Green Glue Compound very efficiently converts this mechanical energy to heat. The vibration energy is not isolated, it’s dissipated and gone. Which door is right for my project? The IsoDoor SD, IsoDoor HD, and IsoDoor V can be used in any situation. However, these doors do have different advantages that make them more suitable for specific projects. Most often used in common walls that require more than the standard solid core or solid wood door. Hotels, home offices, and bedrooms commonly utilize this model. The IsoDoor V will keep up with walls that have resilient channel or MLV installed without losing performance. This sound dampening door is 1-3/4" thick, weighs 140 pounds at a standard size of 36" x 80", and performs great in walls up to STC 47. Most often used in offices, vocal booths, and other similar areas where privacy is of greater concern. This sound dampening door is 1-3/4" thick, weighs 240 pounds at a standard size of 36" x 80", and performs great in walls up to STC 55. Most often used in home theaters, recording studios, and other areas to maintain high STC ratings. The door slab is 2-1/2″ thick and is supported with a continuous piano style hinge that runs the full height of the door. Despite the massive 340 pounds, the smooth operating hinge requires only 1/2 LB of operating force to open and close the door. The IsoDoor HD will provide great performance in any wall assembly with an STC rating of 62 or lower. Another version of the IsoDoor HD is the IsoDoor HD LF. The specs on the HD LF are very similar to the HD, but the change in core design brings a considerable increase in low frequency isolation. We strongly recommend alternating the type of door when setting up communicating assemblies. Combining the IsoDoor SD with the IsoDoor HD or combining the IsoDoor HD with the IsoDoor HD LF will help avoid common resonance issues that occur when two similar materials are installed in the same assembly. Two IsoDoors can be used in the same communicating assembly with a slight change in core design to avoid these resonance issues. What is the difference between TotalMass MLV and other brands of mass loaded vinyl? What is included with each IsoDoor? Pre-hung smooth slab in jambs to match any wall depth. Full perimeter rubber seals, fully mortised automatic door bottom, hinges, and acoustic threshold. Slab bored for 2-3/4″ backset to fit standard handle, to be provided by the customer. Installation instructions, one year warranty. Endless phone or email support for installation and project planning. Where should I use mass loaded vinyl? Technically anywhere you would like. There are other products that are less costly and more efficient in isolation that we suggest for most wall, ceiling, and floor assemblies. Because of this, we often only recommend mass loaded vinyl in lightweight assemblies with minimal layers of material, or for utility use in fences, doors, windows, duct, cars, etc. What options are available with each IsoDoor? What are the standard IsoDoor sizes? Our standard door sizes are 36″ x 80″. Options are available for each door at 30", 32", 34", and 42" widths. Options are available for each door at 84" or 96" heights. Other custom sizes are available upon request. Each door model is also available in a double door assembly (French doors). How does mass loaded vinyl help to isolate in walls and ceilings? When used in a framed structure, any benefit created by mass loaded vinyl is not from the actual mass itself. The structure already weighs several pounds per square foot more than the MLV. To increase isolation considerably with mass alone, the material would need to double the structure weight. What MLV brings to the assembly is a material that resonates like no other building material. Every structure or material has a resonance point. Including mass loaded vinyl in the structure will resolve many resonance issues allowing consistent performance in mid to high frequencies. However, using different thicknesses of materials for drywall or wood layers, or the inclusion of Green Glue Compound between layers, will also resolve these common resonance issues. Communicating doors install in the same wall back to back with anywhere from 3″ to 24″ between the doors. Our line of IsoDoor is unique in that we have full communicating door testing for any combination of IsoDoor style in several different assemblies. The advantage of communicating doors is considerable. With doors installed back to back, a redundancy in seals and dead air space between extreme mass is created. This allows doors with single operable performance in the low to high STC 40’s to achieve ratings in the mid to high STC 60’s when communicating. This level of performance would not be possible in a single operating door. Is mass loaded vinyl better than other products? More recent advancements in sound isolation with resilient sound clips, damping compounds, and rubber underlayment minimizes the value of mass loaded vinyl in a framed structure. However, where these new products cannot be used, the mass loaded vinyl likely can. Including fences, doors, windows, duct, cars, and other similar uses. Have the IsoDoors been tested? The entire line of IsoDoor was tested in 2012 at NWAA Labs as single operable doors and in communicating door assemblies. We have 15 official tests related to the IsoDoor line with performance ranging from STC 29 up to STC 65. Will mass loaded vinyl isolate footfall noise? No, mass loaded vinyl will not help to isolate impact footfall noise. What is the lead time for my order? If a standard size door is purchased, then a lead time of about three weeks is typical for small orders with less than four doors. Lead times on larger orders are quoted at the time of purchase and range anywhere from four to eight weeks depending on the size and complexity of the order, as well as the location of the delivery. Our manufacturing process is on a first come first serve basis. We suggest ordering as early as possible to be included in the manufacturing schedule and to avoid project delays. Do these doors come with a warranty? The entire line of IsoDoor is backed up with a full one year warranty from the receiving date. Warranty information is emailed once the door ships. This information must be completed and returned to become valid. What is hat channel, where do I get it, and what type do I get? Furring hat channel is a steel stud framing member that pressure fits into the resilient sound clip. The sizing is pretty universal, typically manufactured at a 2-1/2″ width that expands up to 2-7/8″ while stocked. Drywall distributors, local building supply stores, and steel stud suppliers are typically the best sources for hat channel. Resilient channel is not the same as furring hat channel. Make sure not to purchase or use the word resilient when describing the channel. Should I space the hat channel 16" or 24" apart? We recommend 24″ on center spacing for hat channel rows when installing single or double layer drywall (up to 6 pounds per square foot of material). We recommend 16″ on center spacing for hat channel rows when installing triple layer drywall (up to 9 pounds per square foot of material). How do I decide which resilient sound clip to purchase? When selecting a clip, we recommend reviewing sound tests, UL tests, quality of design, and the materials used in the clip. That alone will weed out several clips that have limited to no testing in both sound and fire tests. The other points to consider are the materials used in the clip and quality of design/engineering for the clip. Does the design of the clip even make sense? Is the base of the clip just metal or plastic or some indescribable foam? A well designed resilient clip will have a resilient base, a nice thick sturdy metal to hold the channel, and a design that decouples the head of the attaching screw from the clip and framing as much as possible. So don’t get caught up in advertised STC ratings or OITC ratings. They can be inaccurate, inflated, or simply estimated rather than actual ratings. Which resilient sound clip do you recommend? Over 150 sound tests in various ceiling and wall assemblies in both lab and field conditions. Currently 40 UL approvals in many different assemblies. A well engineered product from the design of the rubber, the characteristics of the rubber, the strength of the metal in the clip, and the consistent manufacturing from one clip to the next. Pliteq is a straight forward and honest manufacturer with a reputation for accurate and consistent product testing. Even with all the millions spent in testing the GenieClip® RST, it still remains very competitive in pricing. There are expensive clips and cheap clips. Why not get the cheap ones? The GenieClip® RST is fully tested for STC, OITC, IIC, has multiple UL ratings, structural load tests, and more. The design and production quality of the clip is much higher than any other clip available. The sound tests are consistent and numerous, completed in multiple acoustic labs or in the field over several years. The tests are done without tricks to juice the ratings. Other clips usually have limited sound testing from a single acoustics lab years ago. The sound tests use tricks like thicker insulation or a wider framing span. The real world performance gain of $2 resilient clips is about equal to using resilient channel. The savings with these types of clips may seem significant initially, but when considering the overall project cost and the performance lost with the lower performing clip, it is not worth the difference in price. Replacing the cheaper clips after the low performance is realized will be difficult and costly. Does my clip need to be UL rated? Most assemblies require UL rating whether it is for commercial or residential. You can certainly get away with installing clips that are not UL rated in residential construction and even some light commercial construction. Even if a UL rating is not required by building code you should still use a fire rated product. The extra cost is negligible and sometimes UL rated clips are even less than non-UL rated brands. What is the difference between a resilient sound clip and resilient channel? Resilient sound clips are installed directly to the framing roughly every five square feet using a basic pattern with furring hat channel attached to the clip creating rows that will be used to hang drywall or plywood. This installation will decouple the drywall or plywood from the framing by about 1-1/2″. Resilient channel installs in rows spaced 16″ or 24″ apart attached directly to the framing with connections at each framing member. The one-legged design of the resilient channel is meant to have the leg of the channel attached to the framing with the bulk of the resilient channel free floating. 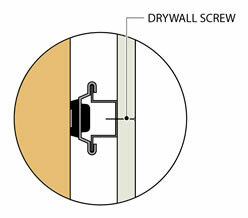 The drywall or plywood is screwed into the free floating portion of the channel in a way that does not connect back into the framing. This installation will decouple the drywall or plywood from the framing by about 3/8″. A successful installation of resilient channel is very uncommon. Most installers will accidentally screw the drywall into the channel and then into the framing. This mistake, known as a short circuit, significantly reduces the performance of the resilient channel and sometimes completely eliminates the performance gains that could have been achieved. Resilient sound clips and furring hat channel cannot be short circuited unless the installer uses a screw that is several inches long. Even with a proper installation of resilient channel, a high quality resilient sound clip still rates several times better in STC, IIC, and OITC. 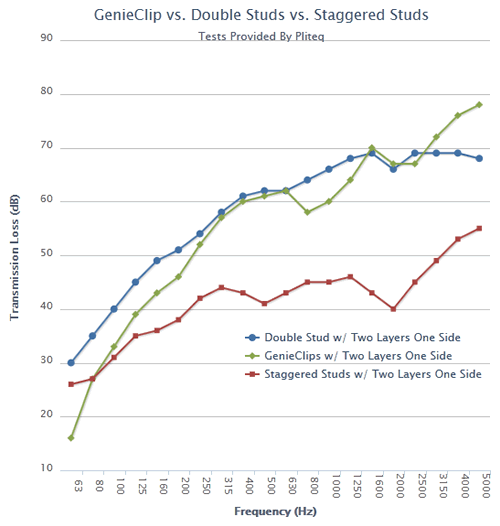 This is due to many factors including increased air gap with the resilient clips (1-1/2″ vs. 3/8″), added benefit of a thick rubber base (assuming a clip like the GenieClip® RST), fewer connections (one every five square feet for the clips vs. one every framing member for resilient channel), and significantly more resilience because the channel is free to flex between the clips. As a material, furring hat channel is just as resilient as resilient channel. The resilient channel though is connected to the assembly through hundreds of connections which keeps the resilient channel from really fully flexing and ultimately dissipating energy (isolating sound). Resilient sound clips allow the furring hat channel to flex because each clip holding the channel is spaced four feet apart. This increases resilience and increases isolation across all frequencies. What about that all rubber clip with the two metal ends I see online? It does not matter if the claim of extra decoupling of the hat channel because the channel is embedded in rubber is accurate or not. The tested performance is what matters. All sound tests performed on this clip by the manufacturer will show that the clip performs well, but still under the majority of resilient clips you will find for sale online. The claim for easier installation is not realistic if you really think about it. With full 12′ pieces of channel, which isn’t always the case, the channel is often much shorter, you can put at most three clips on the channel. You still have to chalk line for the clips and channel to make sure you install them straight. Just because a 12′ section appears straight, does not mean it will line up with the next 12′ section or the one following that. Your rows can easily be off by an inch from one end of the wall/ceiling to the other end. That will become a major problem for your drywall hanger when trying to find the channel. The attaching screw head rests against the metal end which wraps around the clip and comes in direct contact with the framing. In the end, the testing is what is important, but that is a clear design flaw that likely reduces the performance of the clip to give it the overall lower rating it does have. With most clips, the acoustical load is what we worry about. From what we have heard from the manufacturer of this clip, there appears to be some concern over the structural support when installed on a ceiling. Not that you can’t install the clip on a ceiling, but with a double layer drywall assembly you may need to tighten the spacing of the clip. This decreases flexibility, reduces the performance, and adds extra cost in clips. How do GenieClips® and specialty framing compare in performance? Most the testing you will find for double stud and staggered stud framing are lab tests for walls only. We still have not seen a sound test of any kind for a ceiling with independent joists. However, the concept of decoupling with framing is well established, so there is no reason to assume an independent ceiling joist is not significantly better than a standard fixed joist. The real question is how resilient sound clips compare to double stud walls, staggered stud walls, and independent joists. The STC rating of a staggered stud wall with double layer drywall on one side and single layer drywall on the other side is STC 47. The transmission loss in decibels at key low frequency points of 80Hz and 100Hz are 29 and 36. The STC rating of a GenieClip® RST system in the same type of assembly is STC 61. The transmission loss in decibels at key low frequency points of 80Hz and 100Hz are 27 and 33. You can see the GenieClips® RST perform 14 points higher in STC (every five points a doubling effect) and just a few points lower in the lowest frequencies. This performance loss in low frequencies can be made up by adding a third layer of drywall either on the clips or on the other side of the wall. This extra layer will change the 80Hz and 100Hz performance of the GenieClips® RST to 31 and 39 and increase the STC even further to an impressive STC 64 now exceeding the staggered stud wall in performance without taking up additional floor space. The tests referenced were done in the same lab so comparing the two isolation methods is accurate. The STC rating of a double stud wall with double layer drywall on one side and single layer drywall on the other side is STC STC 64. The transmission loss in decibels at key low frequency points of 80Hz and 100Hz are 35 and 40. This is clearly a high rating in low, mid, and high frequencies. The double stud wall will rate 3 STC points higher than the GenieClips® RST in the same assembly and even more significant gains in low frequency performance when comparing head to head with GenieClips® RST in a similar mass assembly. However, adding that additional layer of drywall to the GenieClips® RST or to the other side of the wall will increase the STC to match the performance of the double stud wall and the 80Hz performance within 4 points with the 100Hz performance now just within 1 point. This is a tough one because there are no tests for independent joists that we can use to compare to the GenieClips® RST. The concept of framing in independent joists, meaning joists that are separate from the structure and used to support the ceiling drywall only, definitely makes sense. It’s not a crazy assembly or gimmicky approach. We expect the performance of this method to be very high and likely similar to what a double stud wall can accomplish, but adjusted for a typical ceiling rating. Since GenieClips® RST with four layers of drywall will rate nearly the same as a double stud wall with three layers of drywall, we believe it is safe to assume that this performance comparison will be comparable in a ceiling assembly. The testing discussed above was all done in the same lab and not in the field. In doing so, they are only comparing the performance of the isolation method and not the performance of the isolation method in relation to the entire assembly (adjacent walls, floors, ceilings). Staggered stud walls – The problem you will find with staggered stud walls is while the studs are offset and decoupled, they share the same top plate and bottom plate framing which tie directly into the ceiling joists and sub- floor. This is a major flanking issue. The staggered stud wall is already shown to be an average performer considering the effort in construction, but in field tests it will rate even worse. A staggered stud wall with clips installed is a great idea for increasing low frequency isolation, but a staggered stud wall alone is really overrated. Double stud walls – In the lab there is no concern over flanking so the results can be misleading. If you use independent joists with double stud walls, then the top plate connection is not a concern. The floor flanking exists whether you have double stud, staggered stud, or a resilient clip system so that issue must be addressed separately. Most assemblies though will tie the second stud wall into both the ceiling and floor without the same break in materials that you have from one stud wall to the other. So your overall assembly is a double stud wall assembly, but your new stud wall transmits sound easily into both the ceiling and the floor. So the performance gains in the lab are significantly reduced. Not to mention the fact that you will lose in floor space at least the depth of the framing and a 3″ gap between the existing and new stud wall. That is a 6-1/2″ loss in floor space vs. a 1-1/2″ loss in floors space with resilient clips. Independent joists – A great way to isolate the ceiling, but can become very complicated in the field. Here are a few problems with setting up a system like this. One, you won’t have much room for lighting and really no room for recessed lights since each joist will need to fit within two existing joists. Two, you won’t have much room for HVAC duct work. Three, if duct work, electrical, and plumbing already exist in between the joists then installing the independent joists can be very complicated. The only way to resolve these issues is to drop the entire joist, or most of the joist, beneath the existing joists rather than in between the joists. Problem is you will lose a serious amount of head room. Impossible for ceilings 8′ and lower without reducing head room to unusually low levels and not attractive for ceilings 9′ or lower. Independent ceiling joists will also require the use of double stud walls, or at least newly framed walls, resulting in both loss in head room and loss in floor space. It definitely works, but your room will really tighten up quick. How can I improve the performance of a resilient sound clip system? In walls, add mass and damping to increase isolation in all frequencies. In ceilings, you can add mass and damping to increase the STC and IIC rating (airborne and footfall noise). Add a resilient underlayment or damping to the floor above to increase the STC and IIC rating further. Should I include a damping compound or pre-damped drywall on the clipped channel? Including damping or pre-damped drywall is valuable in a resilient system. 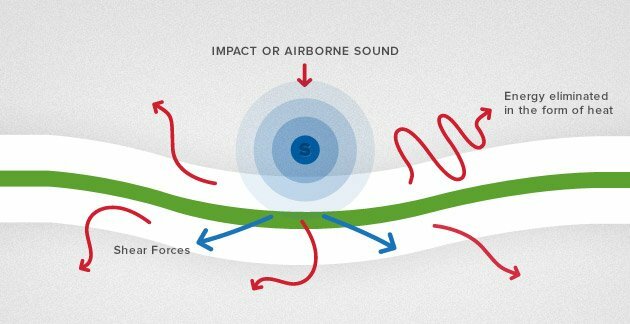 Expect significant increases in isolation of both airborne and footfall impact noise, as well as dissipation of vibrations over distance. Resilient clips can achieve high STC and IIC ratings but cannot reduce flanking to the extent of damping compounds. Should I include mass loaded vinyl in a clipped assembly? No, not at all. Sound tests have shown adding MLV to resilient sound clip systems provides little to no gains. It may help slightly with resonance in lightweight wall assemblies. However, this can also be resolved with additional mass at a fraction of the cost. Do I need to insulate before installing resilient sound clips? We strongly recommend insulation. The type of insulation does not matter. Regular fiberglass batts are great, or something else soft and fluffy will do the trick. Insulation has increased value in decoupled assemblies because the path through the framing is decoupled leaving transfer between the framing as the best possible path. Add some insulation to lower the resonance point of the assembly. I have a ton of recessed lights, is that a problem? Yes. Recessed lights equal lost mass and a reduction of 1-2 STC points per light. Restore this lost mass with the QuietBox. Use the GenieClip® LB to install the QuietBox resiliently in a decoupled ceiling. Click here to view the QuietBox for recessed lighting. Where do I use GenieMat® RST? In floors to isolate impact footfall and airborne noise transfer. Most commonly used in structures with concrete sub-floor and/or resilient ceilings. Which thickness should I use? Concrete sub-floor without resilient ceilings: The thicker the better. Significant gains with even the thinnest GenieMat® RST, near 60 STC/IIC performance with the thickest GenieMat® RST. Wood sub-floor without resilient ceiling: Many components to consider, read Maximizing Rubber Underlayment Performance for detailed information. What type of flooring can be installed over the GenieMat® RST? GenieMat™ RST is tested for use with all flooring types. Tile, stone, vinyl, VCT, hardwood, laminate, carpet, and other similar flooring types can be installed directly to GenieMat™ RST. Fixed flooring, such as tile, stone, vinyl, VCT, and glue down hardwood, requires the GenieMat™ RST to be glued to the sub-floor. Floating floors, such as laminate, nail-down hardwood, and carpet do not require the GenieMat™ RST to be glued to the sub-floor. What level of performance should I expect? Performance will vary depending on the assembly. We provide limited reference to performance in the downloads available on the GenieMat® RST product page. Submit information on your assembly via email for a performance evaluation. Include detailed information about each layer in the assembly from the drywall ceiling to finished floor. Is cork or foam better than rubber? Cork and common microcellular foams will rate about one-third the performance of a truly resilient recycled rubber like the GenieMat™ RST. My HOA is requiring a certain rating for my remodel, will GenieMat® RST work? HOA’s across the USA will require new floors to meet certain STC or IIC requirements. The requirements are often so high that the customer will never achieve the rating. Any rating in a wood structure well over 55 STC or IIC is likely not possible using GenieMat™ RST without decoupled ceilings. Any rating in a concrete structure well over 60 STC or IIC is likely not possible using GenieMat™ RST without decoupled ceilings. This is not a limitation exclusive to GenieMat™ RST, but a limitation on the physics of the structure in relation to sound isolation. Apply Green Glue Compound from tubes using a standard quart sized caulking gun. Apply Green Glue Compound from five gallon pails using our quart size Green Glue Dispensing Gun. Can I apply Green Glue Compound to the framing? No, this would provide no benefit. Do I use nails or screws in conjunction with Green Glue Compound? Yes. Green Glue Compound is not an adhesive, only a damping compound. Follow standard screw patterns of one screw roughly every eight inces. Screws assist with the compression of the Green Glue layer into a thin film.